Over the weekend I crossed a few rivers. In Pittsburgh it's something we do a lot. You can't get very far in this city without seeing water and crossing a bridge. We're known for it. World wide. The Three Rivers are unavoidable. The Allegheny, the Monongahela, the Ohio. In fact, we can now even go under one of our rivers. I just don't think it's possible to be in this city for even a few days and not fall in love with them. Crossing the Monongahela at Dusk. Red Line. 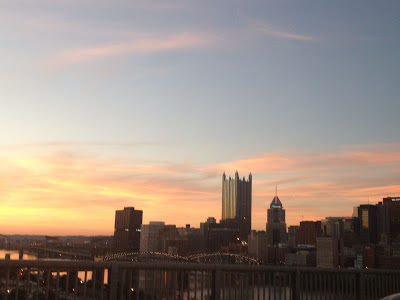 So when the seasons start to turn, and spring starts pushing through winter, and all of Pittsburgh is golden with sun, crossing a river can make your heart swell. With pride. With love. With memories and connections. Makes me pine for late spring evenings at Pirates games. Cheering on our ill-fated Buccos, waiving signs, and trying to get on Root Sports. Speaks of summer afternoons and long bike rides. Working up a sweat with the prettiest view. Is making my way to my mother's childhood roots. Big families, holidays, and feeling loved. Saves pictures of steel mills from my early youth. Graffiti marked higher than I could ever imagine one climbing, production slowing, and stories from my grandparents passed down to me. Reminds me that first loves are often rambling and dirty. Always makes me wonder of mysterious planes lost at the bottom. Is the one no one from out of town will ever remember how to pronounce. Feels like coming home, nestled deep into the back seat of the family van. Warm and sleepy, just before the tunnel leaves the city behind. Causes me to crane my neck out airplane windows. Even to see it's mammoth partner, The Mississippi. Calls for crisp autumn weather. Leaves falling on the water, Steelers fans cheering on their team, and city lights on the horizon. Casts me back to grade school classrooms. Learning about Louis & Clark, Industrialization, , and Science Center field trips. Makes me want to show new love all of the things I love about this city the most. To explore its nooks and crannies, to burst at the seams with all things black and gold. So dear readers, what do the Three Rivers do to you? Share your love in the comments. And if you've never been to Pittsburgh before, let us know. I might know someone who'd love to show you around.